Delicious chocolate chip cookies made with vanilla instant pudding in the batter. To Read More, Click On The Recipe Title. I made these Chocolate Chip Pudding Cookies while I was visiting my brother in Virginia for Thanksgiving. These are absolutely delicious. These cookies have a wonderful vanilla and chocolate flavor, they are also very soft, chewy and rich. I found this recipe on TheVeryBestBaking site. I used a good heaping Tablespoon of cookie dough for each cookie, I also used parchment paper to bake them on. The cookies baked for exactly 10 minutes, they cooled on the cookie sheet for 1 minute and then were put on a cooling rack. They may not look like they're done at 10 minutes but they are, resist the temptation to bake longer. 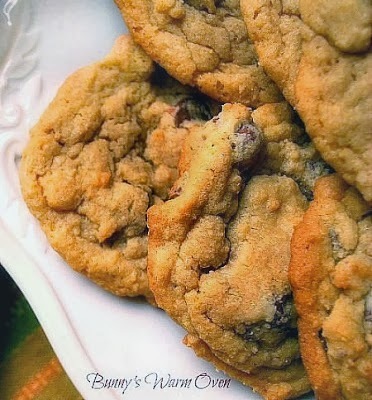 You'll be rewarded with a slightly thick cookie that will absolutely melt in your mouth! After making these, I don't think I could make regular chocolate chip cookies again! The recipe makes 6 dozen cookies so this would be perfect for anyone making cookie trays for Christmas. I halved the recipe for us, trust me I could have made a whole batch and they would have eaten all of them! You can't stop at one cookie, they are incredible! Enjoy! To Print The Recipe Click Here. Looking for another delicious chocolate cookie recipe? Try this delicious Skillet Chocolate Chip Cookie! Looked again, but don't see if you specified what size box of pudding....I have 2, so don't know which, and I want to make these, TODAY! Diana I think there are only 2 sizes, I used the small box of instant pudding. I'm sorry . I thought I answered this! Girl, I just made these and used M&M's. I halved the recipe, which yielded almost 4 dozen. Wow, you are right. These are amazing! My son gobbled them up and asked for more. WHOOT!! Love it Debby!!! They are rich, soft and DELICIOUS!! Thanks for coming back and reviewing!! Could I use sugar free vanilla pudding and splenda white and splenda brown in place of reg sugar?? Hi Tiffany! Well I've never used sugar free pudding in recipes, but my guess would be you can. You can use the splenda as well. Use the same amount of splenda as for the sugar in the recipe.